STUNNING GEM! 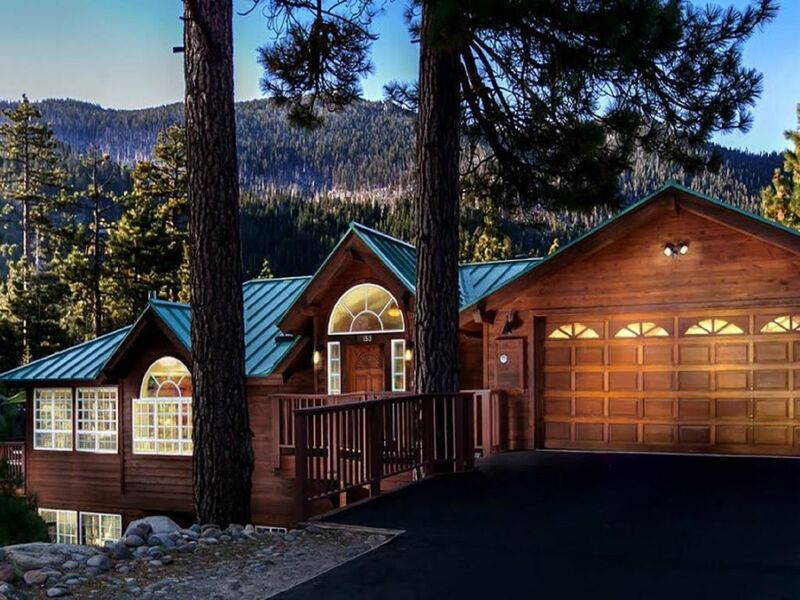 8BR /6.5 BA, Views, Hot Tub, Private Setting Near Heavenly! Check out our fantastic guest reviews and see what makes this home so unique! This well-appointed 8 bedroom, 6.5 bath luxury home features first-class amenities and 6 private view decks. Treat yourself to an elevated experience from the superb setting, large gourmet kitchen, open floor plan and unmatched level of comfort. This private home has a rare combination of dramatic views, an ideal location, great proximity to the lake, golfing, shopping and casino core, yet nestled in acres of pristine forest. • Level access garage & driveway. Parking for 6 vehicles with NO outside stairs. • Fully-stocked chef's kitchen with quality cookware. The home's proximity saves time spent traveling to your destinations. • Heavenly Ski Gondola and Shopping Village. ✮✮WINTER GUARANTEE ✮✮ We make getting to the slopes hassle-free with our fast and reliable snow removal service. An attached garage and level driveway is essential for your safety. No frozen steps to fall on or big slippery hills to navigate on a snowy day. * Home is best-suited for 6 couples with up to 8 children. * Groups comprised of all adult singles may not be a good fit. We are happy knowing we offer a unique and authentic experience. Each interaction with a guest is an opportunity to contribute to their memory making. Don't take our word for it, read our many guest reviews. The neighborhood is exclusive, private, yet just a few minutes to shopping, beaches, skiing, hiking trails, entertainment and Edgewood golfing -- we think the setting and location are perfect. This is a great spot for nature enthusiasts. Immerse your family in the great outdoors. If you are looking for upscale lodging for your family and friends, in South Lake Tahoe, you have come to the right place. Built from the heart with passion, this nature-based home features many expansive windows to take in the stunning views. Trail access and sledding in the backyard, ample room to roam around the property. There are 5 interior steps to main level. The house was absolutely perfect for our group ski trip. Great location and setup, with all the amenities you could want. This beautiful property was everything we hoped for and more. Located in a nice neighborhood, close to the ski slopes with wonderful mountain views. Our group had so much fun and there was tons for room for everyone. The kitchen was well stocked and we made some gourmet meals of our large group. Everyone kept commenting on how perfect this rental was for our trip. I highly recommend this property year round. The house was perfect for our large group. Gerard was very responsive, and the check-out was extremely easy! Highly recommend! Our family enjoyed a fabulous week in the snow! Everything about this place was outstanding! Appliances... bedding....daily snow removal! Would highly recommend for anyone looking for a luxurious place to stay. This is the first time that the entire family was able to stay under one roof. The house was incredible. We even saw a wolf outside the last day. All amenities were appreciated and snow removal services were appreciated. We did complete the survey with minor items to even improve this terrific vacation. Hopefully Gerard you found the house in great condition after out visit. We take pride in leaving the house clean and in good order. Thanks for a great experience. Thank you for the outstanding 5 star review and how well you left the home. Much appreciated! What a wonderful review to receive. It was a pleasure meeting you and exceeding your expectations. A great start to the New Year! SUMMER: Relax at the beach with our free parking pass. Gain access to a swimming pool, Lake beach, tennis courts, & snack bar on the lake.